Every week, I post a picture of the food that has gone bad over the last seven days. Why do I do this? Because in March of 2008, I finally got fed up with the amount of food I was wasting, and I thought that showing my waste to other people would motivate me to use up my food instead of wasting it. Because this often embarrassing practice was so helpful for me, I invited other bloggers to join me in posting their food waste photos, and Food Waste Friday was born. So, the other night, I made some quesadillas and I purposely made one extra so that I could send it in Mr. FG’s lunch. I refrigerated it in a Pyrex container and hurriedly grabbed it while packing his lunch the next day. And then I realized I’d accidentally put a container of leftover fish into his lunch. It wasn’t good leftover fish, like fish cakes…it was a fish from when I’d tried a recipe that ended up tasting really…fishy. Note to self: Must. Check. Containers. Anyway, it wasn’t great fresh fish, it was even less lovely leftover fish, and it would have been disgusting heated up in a microwave at work (whereas at home, I could have heated the fish in a cast iron skillet). 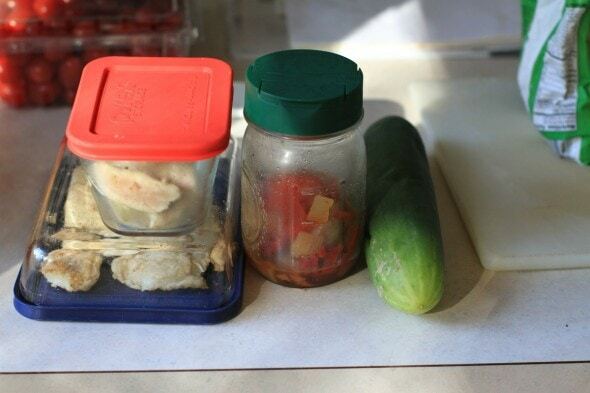 So, he went out for lunch, and the fish (in that rectangular container) is part of my food waste this week. What else is in there? The piece of chicken was leftover from when I made Chicken Tacos. Which were great, but I made too much chicken, and while I ate lots of the leftover chicken, when I cut into that piece, I realized it was underdone and I never got around to recooking it. I also wasted a cucumber, which is weird, because we ate a lot of cucumbers this week, but I must have accidentally used up the new ones first. And there are some leftover grilled veggies. I meant to add them to scrambled eggs, and I did do that, but just not for enough days! How did you do this week? If you blogged about your food waste, link us up by entering your info into the widget below. You’ll save money, reduce your trash output, and get a little publicity for your blog! And if you don’t blog, you can still share about your food waste by leaving a comment. 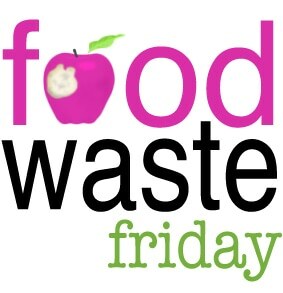 Those of you who participate in Food Waste Friday can grab a fancy-schmancy button to perk up your posts. If you copy and paste the following code into your Food Waste Friday post, this little graphic will appear. If you blog on WordPress, just make sure you’re in html mode when you copy and paste the code, or it won’t work properly. « Remember the Grout Renew stuff? A reader used it too! I’m not that fond of fish, so fishy fish would have been a no go here. I totally understand why you had some go to waste. I have some leftovers that I hope to add to soup today, so hopefully I won’t have to show pictures of them next week. In the meantime, I had some tomatoes that went bad before I got to them. I was going great – no waste at all. Then I had my own fail. I forgot to put FOUR packs of hotdogs back into the deep freezer. :-<<< The financial hit isn't bit, $6-8, but unnecessary waste annoys me. I feel your pain! I had that happen this last summer with chicken, and I was so upset. It is wonderful having the kids around to help me take care of groceries, but sometimes mishaps happen. That day one of the bags for the freezer ended up in the pantry. When I went the next day to put things away on the shelves I found it. It seemed like such a huge waste. I stewed about it for days…to myself. I would never want to do anything to discourage the kids from helping me take care of groceries. This week I didn’t go so well – I wasted a whole bunch of homemade gummy candies and some other bits and pieces. Oh, fun! I will be sure to show her. I threw out about a cup of black beans and a serving or so of baked ziti. My son is the only one that loves the leftover ziti and he ate it until he couldn’t eat anymore, lol. Oh and a couple of eggs that were stuck to the container this morning, they must have had a hairline crack in them or something. Sounds like my lunch experience this week where my husband called me from work to say “the enchilada casserole was actually half a cup of butternut squash.” Although we did manage to salvage both at some point, he did end up going out to eat that day. Time to invest in some see through containers. The day I messed up packed lunches for the Kids to take to school was fun. Not. They still remind me to get it right. As for the Hubby he forgot to take milk to work today but fortunately that’ll be used up here. Whole bag of carrots for me today as waste. Shocking. No other word for it! ha ha, that’s so funny about the fish! I do that sort of thing all the time. I’m curious to hear from you and others – do you have a length of time that you stick to for saving food vs pitching it? Like, do you pitch after a week or more? I tend to have a long grace period, especially for things that you can sautee thoroughly – but I’ve spent some time in rural Africa, so I am very lenient about food and err on the side of not letting anything go to waste out of principal – but maybe I stretch it too much :). I use my senses to tell me if the food is beyond salvage: how does it look, smell, taste? I don’t like with anyone with a delicate stomach or compromised immune system so only normal precautions are necessary. That reminds me of the time I thought I grabbed the margarine container being reused to package fresh fruit to go with my packed lunch – and grabbed the one with the margarine in it instead. Not a great side with lunch that day! I found a bag of disgusting spoiled potatoes in my basement food storage area- I know they were very VERY old, and I’m glad I found them before they, um, caused a big mess (and smell). Also tossed about a quarter of a container of half and half that I left out on the counter before I left for work one day this week after adding a splash to my morning coffee. I hate when I do stuff like that – oh well. The fish lunch gave me quite the chuckle. I am happy to say that my waste for the week was 1/2 of a cherry tomato that had mold. I know it might seem weird that I ate the other 1/2. There is 1/2 cup of carrot soup in the fridge that if I do not eat tomorrow, I will throw out. So my plan is to have it for lunch tomorrow. I was seriously racking my brain for any food waste and it is ZERO ZILCH NADA!!! Yay! We were in the last weeks of a pantry challenge and we literally ate every bite of every thing so we could successfully complete the challenge. We went to dinner at a friend’s house and they sent us home with a pizza since they had ordered too much. We both had some for lunch yesterday and decided to throw the rest away because it wasn’t very good. I hate wasting food, but I see no sense in us forcing ourselves to eat unhealthy food. I also wasted a couple cups of lettuce that turned really brown.